Martyr Christina of Tyre – Orthodox Church in America. This saint is also known as the Holy Great Martyr Christina. After reading of her life and her eventual death I simply couldn’t paraphrase it so am just going to direct you to her story with the link above. This young woman went through many tortures and trials. There is no way she could have survived any of them without divine intervention. 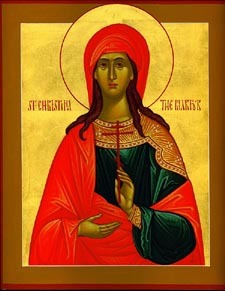 Holy Great Martyr Christina, pray to God for us here on Earth. Amen. This entry was posted in Church, female Saints and tagged Eastern Orthodox Church, Saints. Bookmark the permalink.